KEY WEST 1996 opening staff hurricane glass pin. Purple hurricane glass with orange slice and cocktail umbrella. Text above logo says "Opening staff" and below it says "Key West". Back Pattern: 2 lines and HRC logo. Mint condition Mailed in cushioned envelope. Unless stated, ALL items are new and in excellent condition. FROM A SMOKE FREE AND PET FREE HOME. 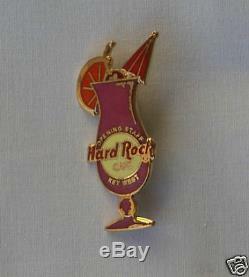 The item "Hard Rock Cafe pin KEY WEST opening staff hurricane" is in sale since Friday, March 6, 2009. This item is in the category "Entertainment Memorabilia\Music Memorabilia\Rock & Pop\Artists H\Hard Rock Café\Pins". The seller is "walnutint" and is located in Ashburn, Virginia. This item can be shipped worldwide.